Are you looking for a car accident doctor in Denver? Whether you were on a motorcycle, in a car or a truck, or driving a rig, an accident can cause a lot of pain and make life hard. The faster you get physical therapy, the faster you will heal and get your body back to normal. Recovery can be hard, but we can help you at Denver Physical Medicine. Here are just a few of the reasons to seek out physical therapy after an auto accident. Prevent long-term damage and pain. If you don’t address your pain and the causes behind it right away, you stand a much higher chance of being in pain for a long time. Once your body learns new patterns of movement, even if they are ones that cause you pain, it gets harder and harder to change them. An auto injury specialist in Denver can help you change these patterns before they become ingrained in the ways you use your body every day. Physical therapy helps you recover fully. Many accident victims find themselves “mostly recovered.” They can get through their days, but they have more pain, stiffness, headaches, etc. than they did before the accident. When you do auto or motorcycle accident physical therapy in Denver, you can address these lingering problems or avoid them entirely. You shouldn’t have to live with a reduced quality of life simply because you got into an accident. Physical therapy can help reduce pain. When you’ve been in an auto, truck, or motorcycle accident, it’s easy to sit around all day because of how much you hurt. While moving may feel counterintuitive, the right kind of movement, as prescribed by a car and truck accident doctor in Denver, can actually help you feel better. We create individualized programs for you, so you never have to push too hard on your journey to feeling good again. Physical therapy effectively addresses whiplash. Whether your accident occurred in a car, a truck, or on a motorcycle, you most likely experienced whiplash. This is what happens when your head keeps moving forward even as your vehicle suddenly stops. Your head whips backward, which can damage muscles, tendons, ligaments and more. 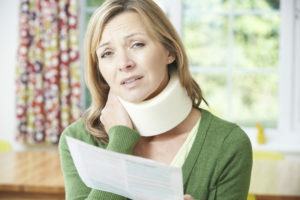 Whiplash is one of the most common complaints after a car accident and, as your auto accident specialist in Denver, we can address it to minimize your pain and suffering. If you have recently been in an accident, call us at Denver Physical Medicine for an appointment today. We would love to help you feel better soon!